It was an era etched indelibly into America’s distance-running conscience. Two high school kids, their efforts still standing the test of time, had earned Spokane a star on the national running map. Some 45 years ago, first Gerry Lindgren of Rogers set a prep mile record and shocked the Russians at 10,000 meters. Then Ferris’ Rick Riley followed two years later with a stunning 8:48.3 national high school two-mile record. The area in more recent times, thanks to two decades worth of state cross country team champions, has been likened in one story to Kenya’s Rift Valley, the African locale that consistently has produced the world’s finest runners. But that period of time five decades ago was as special as it gets. Riley has never really been away. He taught and coached here for a time during the 1970s, worked and traveled for White’s Boots for 20 years and more recently is employed at REI. Although he hadn’t run competitively for more than two decades, Riley’s name resurfaced last summer when he whetted his race appetite at the National Masters Meet in Spokane, running third in the 1,500 meters in the 61-65 age group. 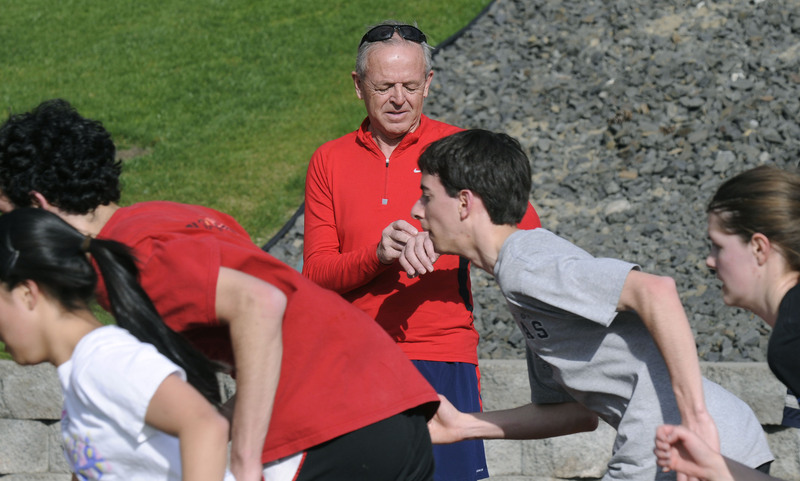 He made further news this spring by becoming distance coach at St. George’s School. “Frank” is Frank Shorter, who would become the Olympic marathon champion in 1972. Riley finished second to Shorter in two national championships. One, he remembers, came at three miles when he came from seventh in the field with a searing 54.7-second last-lap burst of speed that carried him past such notables as Lindgren and the late Steve Prefontaine. He trained with world mile record holder Jim Ryun and Olympic champion Billy Mills. Other names he ticks off make up a Who’s Who of distance running legends from the era. He ran all over the U.S., in Europe and the Soviet Union, and had times that range from a sub-4 minute mile to mid-28 minutes for 10,000 meters. His portfolio of accomplishments from high school on is three folders thick in The Spokesman-Review library. But injuries and bad timing prevented him from competing against the Soviets in 1966, the meet boycotted because of the Vietnam War, and later in the Olympic Trials. It has taken time for Riley to reconcile the fact that despite such notable absences he had a remarkable and gratifying career. Rick Riley arrived in Spokane from Curlew at age 13, a sprite whose size proved a natural fit for track and field. At the time, eventual 1964 Rogers grad Lindgren was capturing Spokane and the nation’s fancy. Riley said he and his dad would sit in the family car listening on the radio as Rogers coach Tracy Walters called Lindgren’s indoor races, and Riley followed Lindgren’s efforts to make the Olympic team. “His influence was huge,” Riley said. “I followed everything he did and was at Rogers when he ran 4:06 to set the national mile record. It may sound weird, but I felt if this guy can do it, I can. In several instances he did, competing in and winning numerous meets with impressive times. Riley ran his 8:48.3 two-mile in the 1966 state meet at Washington State. Lindgren, a Cougar then, was cheering him on. After clocking a 13:57.6 three-mile in Canada, Riley would join him at WSU and follow the Lindgren path, primarily the longer distances despite his superior speed. They raced a mile in Trail, B.C., in 1967 and Riley won, both timing 4:11.6. Two months later, Riley’s cross country season ended with an injury, a harbinger of his career. It wasn’t until 1970, when he won the then Pac-8 mile in a record 3:59.2 over Roscoe Devine and clocked 13:24.4 in that race against Shorter, that Riley was pain-free. But another injury later kept him out of the World University Games that year. And while teaching in Grandview and training solo for the 1972 Olympic Trials – from lesson plans mailed to him from his high school coach Herm Caviness – a foot injury ended that bid and, effectively, his national career. “That was the loneliest of the loneliness of a long distance runner,” he said of that year in Grandview. The years have been spent raising his large family – six children and a stepson – the youngest of whom, Daniel with his third wife Keri, will be a freshman basketball player at North Central. His oldest sons, Chris and Eric, had solid high school distance careers at Ferris and West Valley, respectively. Third son Kerry was a promising Eagles runner when his life was cut short, along with fellow runner Eric Trusty, in a tragic auto accident in 1986. That led to a dark period in Riley’s life. Last week, he and daughter Kim, who got him back into coaching with the Mercury Track Club, ran together for the first time in the Race for the Cure. His other daughter, Megan, and stepson Sam Kenyon, have interests away from the sport. Riley said he ran seriously for 16 or 17 years and ran his fastest Bloomsday when he was 39. In 1988 he was diagnosed with Crohn’s Disease. Riley reflected on his career during a time when there was little cash to be earned and performance-enhancing drugs were unheard of. More track runner than road racer, he’s eyeing the World Masters 1,500 in Kamloops, B.C., next year. He’s coaching again, imparting to another generation the wisdom gleaned from his career.